BarleyMax & The Hallelujah Diet - FREE SHIPPING!! The Hallelujah Dietsm is a long-term lifestyle plan, based on God's original instructions to mankind in Genesis 1:29, that emphasizes the importance of raw, living plant foods and their juices. Since the body is made up of living cells, it needs living food at the cellular level. The Hallelujah Dietsm is designed to maximize the amount of vital nutrients that reach the body's many cells. When the body is given the resources and conditions that it needs, it is able to maximize the built-in healing power given by the Creator. Upon rising, one teaspoon of BarleyMax powder - either dry and let it dissolve in the mouth, or in a couple ounces of distilled water at room temperature, but never in fruit juice. No cooked food, or food containing fiber at this meal, so as not to stop or hinder the cleansing process, as the body eliminates accumulated toxins. An eight-ounce glass of carrot juice. If juice is not available, a piece of juicy fruit would be second best. Before lunch, another teaspoon of BarleyMax as at breakfast. Thirty minutes later, it’s either a raw vegetable salad or raw fruit. This also is an all-raw meal, as cooked food is limited to the evening meal. Fruit should be limited to no more than 15% of total daily food intake. An eight-ounce glass of carrot juice. If juice is not available, some carrot or celery sticks would be second best. If desired, a piece of juicy fruit or a glass of freshly extracted apple or pear juice may be consumed. Fiber Cleanse (psyllium-based fiber product) - Serving recommended on container according to weight, either before leaving for work, or late morning. (Not recommended for pregnant or lactating mothers, or for long term use.) An alternative would be 2 to 3 tablespoons of organic flax seed, freshly ground in a coffee mill, mixed into 8 ounces of distilled water or juice. Udo’s Choice Perfected Oil Blend - One to three tablespoons. Can be taken straight, or used on salad. Not recommended for cooking. Vitamin B-12 - To ensure adequate B-12 intake, 1 tablet of a vegetarian, sublingual, methylcoballamin tablet three times a week. Vitally important for pregnant women. Sunshine - Each day the sun is shining, some (15 minutes) sunshine on as much of the skin as possible, as sun is so important in the production of vitamin D.
Exercise - Physical exercise every day for a minimum of 30 minutes is extremely important. Half the time should be in aerobic activity and the remainder in resistance exercises. A stretching and fast walking program is a good place to begin. Carrot Juice - Freshly extracted carrot juice made from large California juicing carrots is extremely important in meeting daily nutritional needs. The carrot juice, along with the BarleyMax, make a dynamic duo in providing the body with high-octane fuel. As a maintenance program, consume at least two 8oz glasses of carrot juice along with two to three teaspoons of BarleyMax daily. When I had my colon cancer in 1976, I consumed 32 to 64 ounces of carrot juice mixed with freshly juiced vegetable greens daily. If a juicer is unavailable, using a convenient carrot juice powder like CarrotJuiceMax, which is produced at low temperature to preserve heat sensitive nutrients, will be a great substitute. BarleyMax - The reason I supplement my diet with BarleyMax is that, for the most part, food produced today is grown in soil that often lacks the nutrients my body needs for building new, strong, healthy, vital, and vibrant cells. 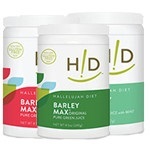 BarleyMax is grown organically and contains the widest spectrum of nutrients from a single source (that I am aware of). I always consume at least three teaspoons daily. When starting, one teaspoon per day may be a good starting point, and then building up to three teaspoons to prevent too rapid of a cleansing reaction. BarleyMax powder did not exist back in 1976. If I had a serious physical problem today, I would increase my carrot juice to six to eight 8oz glasses along with four or more teaspoons of BarleyMax powder daily. The Hallelujah Diet, once understood, is very simple to prepare and apply. We try to follow a ratio of 85% raw and 15% cooked food each day, with the cooked food usually coming only at the end of the evening meal. Freshly extracted vegetable juices, BarleyMax, and distilled water. Fresh almond milk, creamy banana milk, as well as frozen banana, strawberry or blueberry "fruit creams." Soaked oats, millet, raw muesli, dehydrated granola, dehydrated crackers, and raw ground flax seed. Raw Almonds, sunflower seeds, macadamia nuts, walnuts, and raw almond butter or tahini. Consume sparingly. Extra virgin olive oil, Udo's Choice Perfected Oil Blend, Flax seed oil (the oil of choice for people with cancer), and avocados. Fresh or dehydrated herbs, garlic, sweet onions, parsley and salt free seasonings. The following foods make up the 15% portion of the Hallelujah Diet. These are the cooked foods that follow the raw salad at the evening meal. This cooked food portion can be very delicious, and actually proves beneficial for those trying to maintain body weight. Caffeine free herb teas and cereal coffees, along with bottled organic juices. Non-dairy cheese, rice milk, and organic butter, all sparingly. Stewed and unsweetened frozen fruits. Whole-grain cereals, breads, muffins, pasta, brown rice, millet, etc. Mayonnaise made from cold pressed oils. Soups made from scratch without fat, dairy, or table salt. Steamed or wok cooked fresh or frozen vegetables, baked white or sweet potatoes, squash, etc. These foods create most of the physical problems we experience and are not part of The Hallelujah Diet. They should be eliminated from the diet as quickly as possible. Alcohol, coffee, tea, cocoa, carbonated beverages and soft drinks, all artificial fruit drinks, including sport drinks, and all commercial juices containing preservatives, salt, and sweeteners. All milk, cheese, eggs, ice cream, whipped toppings, and non-dairy creamers. Canned and sweetened fruits, along with non-organic dried fruits. Refined, bleached flour products, cold breakfast cereals, and white rice. Beef, pork, fish, chicken, turkey, hamburgers, hot dogs, bacon, sausage, etc. All meats are harmful to the body and cause up to 90% of all physical problems. All roasted and/or salted seeds and nuts. Peanuts are not a nut, but a legume and very difficult to digest. All lard, margarine, and shortenings. Anything containing hydrogenated oils. Table salt, black pepper, and any seasoning containing them. All canned, packaged or creamed soups containing dairy products. All refined white or brown sugar, sugar syrups, chocolate, candy, gum, cookies, donuts, cakes, pies, or other products containing refined sugars or artificial sweeteners. All canned vegetables, or vegetables fried in oil. In 1962, Dr. Frank Logsdon, former pastor of the famous Moody Memorial Church in Chicago, was a dinner guest in my home. Over the dinner table, he told a fascinating story of how he had had cancer and (rather than going the medical route) had gone to the Page Institute in Tampa, Florida. At this Institute, he was told to remove five white foods from his diet and to switch to a raw vegetarian diet. He had done this and his cancer disappeared! Dr. Logsdon was about 60 years old at the time he was in my home. Interestingly, the five white foods he was told had caused his cancer are the same foods my research has shown to be causing most of our physical problems. What are the five white foods causing our physical problems? I will list them, starting with the most dangerous substance we put into our body . . .
. . . contains white fat! The average American meat eater puts over 50 pounds of fat (cholesterol) into his or her body each year! This fat clogs the arteries, which ultimately causes the heart attacks and strokes that will kill approximately 50 percent of our population. Meat is also the culprit in causing colon cancer, breast cancer, prostate cancer, and other forms of cancer. Cancer is responsible for 33 percent of American deaths. And meat is the primary cause of adult-onset diabetes, which kills 9 percent of our population. Meat also causes gout, arthritis, and a host of other physical problems. We are told that we need meat for protein and strength. However, we are not told that the cooking of meat changes the molecular structure of the protein and renders the protein in meat unusable by the body. If we look to nature, we will find that there is not a single animal in the wild that cooks the flesh it eats! More than twenty-five years of research has revealed meat, as it is produced today, to be the single most dangerous food that we put into our body. I have not eaten any meat for over twenty-five years.
. . . is the second most dangerous substance we can put into our bodies for many of the same reasons. We are told milk is the perfect food and needed for calcium. But we are not told that the pasteurizing of milk (heating it to temperatures of 160 degrees or higher) changes the calcium to an inorganic form, which cannot be assimilated by the body. In nature no animal pasteurizes its milk . . . and no animal drinks the milk of another species, nor does it ever drink milk after the age of weaning. The only source of bad cholesterol (LDL) is animal products! Animal products are not good food!
. . . is another white substance that creates untold physical problems and suffering. The body needs sodium, but it must be in an organic form in order to be usable by the body. Table salt, sodium chloride, is an inorganic sodium compound formed by the union of sodium and chlorine that is extremely toxic to the body. This toxicity causes the body to retain fluid in an effort to keep this protoplasmic poison in suspension and out of the cells.
. . . is the fourth white substance creating our physical problems. Sugar is so changed and concentrated from its original plant form . . . that it is actually a drug! Just 10 teaspoons (approximately the amount found in one soft drink) will immobilize the immune system by about 33 percent. Approximately 30 teaspoons of sugar will shut down the immune system for a whole day.
. . . has had all the good substances (bran and germ) removed during processing. Then it is bleached, sometimes with a bleaching agent similar to Clorox. Finally, some coal-tar-derived (carcinogenic) vitamins are added, and it is sold to the unsuspecting public as "enriched." White flour is not good food . . . in fact it is hazardous to your health! In addition to these five white substances, we must also consider the impact of drugs on our bodies. Most people are aware of how dangerous alcohol and nicotine are to the body, but they fail to realize that the caffeine in coffee, tea, and soft drinks is also an extremely dangerous substance. Caffeine is called a stimulant because it excites all of the nerve endings in an effort to rid the body of this poisonous substance. If a person drinks over two or three cups of coffee a day on a regular basis, they will usually develop severe drug withdrawal headaches if they suddenly stop drinking it. Alcohol, nicotine, and caffeine are dangerous drugs! Now that we have briefly covered the substances that are creating most of our physical problems, let us look at the foods that nourish our body. In the May 1993 issue of Back to the Garden, in an article titled "God's Original Diet," I emphasized that the ideal diet for man is raw fruits and vegetables. This opinion is based on more than twenty years of my scientific and nutritional research, biblical study, and the personal experiences of myself and others who have tried this diet. Much of what I say may sound radical to some, but why should any Christian be surprised to find that modern science and personal experience have confirmed that God's original diet of raw fruits and vegetables (Genesis 1:29) is the ideal diet for mankind? It has now been more than twenty-five years since I switched from a diet that was predominately made up of the five white substances listed in the section titled The Most Harmful Foods. These foods had caused me to have serious teeth and gum problems, hemorrhoids, hypoglycemia, high blood pressure, severe sinus and allergy problems, frequent colds, headaches, pimples, body odor, dandruff, low energy . . . and colon cancer at age 42! In 1976, at age 42, I switched to a totally raw vegetarian / fruitarian diet with large amounts of freshly extracted vegetable juices. In fact, for one year, I never ate a piece of cooked food. During that year, not only did my colon cancer go away, but so did every other physical problem I had! After that first year, I added some cooked food to my diet. Presently, my diet consists of approximately 85 percent raw foods, with the balance made up of freshly prepared cooked vegetarian food. I eat no meat, no dairy, no sugar and no white flour products, and haven't for over twenty years! My diet is usually raw until the conclusion of the day, with my only cooked food (if any at all) coming at the end of the evening meal. The reason one should maintain at least a 75 to 85 percent ratio of raw foods is that when food is cooked, almost all its nutritional value is destroyed. All enzymes are destroyed by cooking. Approximately 83 percent of all vitamins are destroyed by cooking, and the heat changes protein into a form that cannot be assimilated. Cooking also reduces the organic minerals our body needs into an inorganic, unusable form. In addition to diet, a lifestyle that includes exercise is an essential element to healthy living. I almost always do stretching exercises, deep breathing exercises, and at least an hour of aerobic exercise each day. This diet and lifestyle has sustained me in perfect health with high energy for more than twenty-five years now!